The art of glass blowing, the pride of Venice, may have originated in the Middle East. This is demonstrated by three ancient bowls from the city of Adria, currently on show at the Corning Museum of Glass as part of the exhibition “Ennion: Master of Roman Glass”, dedicated to one of the most famous glass blowers of the 1st century A.D.
Two of the bowls, perfectly intact, in a beautiful transparent cobalt blue, belong to the Archeological museum of Adria. The third is owned by the Corning Museum. They were found between 1904 and 1905, in a rich Roman incineration tomb with other extraordinary glass vessels and bear the unmistakable signature of their creator. 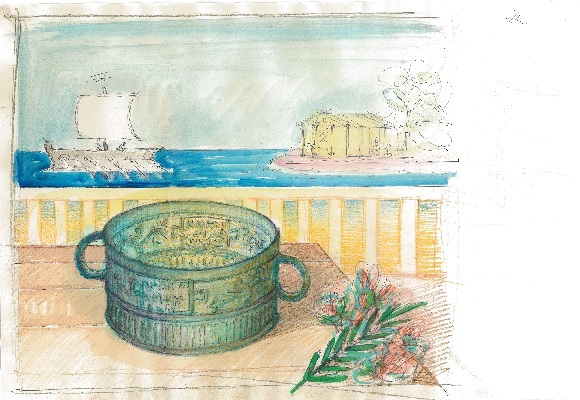 Separated immediately after their discovery, they have been brought back together again after almost a hundred years and are now telling Americans their story until October 19, when the cups from Adria will be returned to Italy. How they ended up in the locality “Cuora” of Cavarzere, six kilometers from Adria, is not known, but it is certain that since ancient times great quantities of Attic glass and ceramic objects took the rich trading routes of ships coming from Greece heading for the ports of Aquileia and Adria, where there were warehouses managed by the multinationals of the time. From here the goods departed in all directions across Europe. As well as precious Paleo-Venetian and Etruscan vessels, The National archeological museum in Adria has a magnificent collection of Roman glass. Particularly refined are the polychrome striped and mosaic bowls, the elegant snail’s head drinking horn and the precious dove-shaped ointment bottle. They bear witness to an art that had also developed locally. “Ennion’s bowls were made with the technique of ‘mold-blown’ glass”, explains Maria Cristina Vallicelli, director of the Adria Museum. This allowed him to obtain surfaces decorated in relief and molded shapes, imitating those of vessels in metal. The streamlined walls are decorated in the uppermost part with plant motifs among which there are two curved handles with Greek inscriptions: the signature of the master glassmaker “Ennion made me” and the wish “let the buyer remember him”. “The master glassmaker made mostly bowls, jugs, pyxes in transparent monochrome glass, decorated with scalloping and stylized relief plant-shaped motifs”, continues the museum director. His works have been found in Greece, Israel and mainly in the West, especially in Northern Italy, which is a sign of the lively trade between the eastern Mediterranean and the Adriatic, as well as of the movement of artisans and the circulation of technical knowledge. That’s why it is commonly thought, though not supported by any definite proof, that Ennion may have transferred his workshop from the coast of Asia Minor to the Upper Adriatic, perhaps to Aquileia”. “Today”, concludes Dr. Vallicelli, “in the whole world there are about fifty surviving vases that can be attributed to Ennion, many of which are fragments, kept in museums and private collections in Europe, the United States and Israel”. From the 1st to the 3rd century A.D. glass-makers like Ennion and Aristeas left significant traces in the Roman province of Dalmatia, whether their goods were imported or made locally. Later the barbarian invasions destabilized the sociopolitical balance in Northern Italy. In 452 Attila destroyed Aquileia leaving the city in total ruin and forcing the coastal inhabitants to take refuge in the islands of the lagoon. It was the birth of Venice. And probably it was there that the craft skills of the population were also transferred. For three centuries all traces of blown glass vanished; but recent evidence found on the island of Torcello suggest that the Venetians never stopped making their enchanting, fragile, transparent masterpieces.